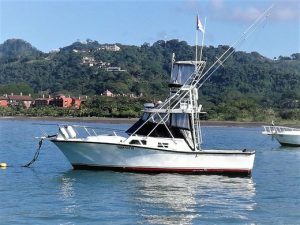 This custom-built 32-foot Rampage out of Herradura Bay near Jacó and Los Sueños Marina on Costa Rica’s Central Pacific coast has either Captain Javier or Captain Juan Sirias at the helm, assisted by an experienced English-speaking mate. Powered by two Caterpillar diesel inboards, she cruises at 28 knots. The boat is equipped with Furuno GPS, Furuno sounder, and Furuno radar; Icon radio, RayMarine radio, stereo sound system, A/C cabin, a head (toilet) inside the console, outriggers and downrigger, and carries an extensive range of Shimano rods and Shimano 30TID reels for both offshore and inshore fishing, plus an abundant array of lures.